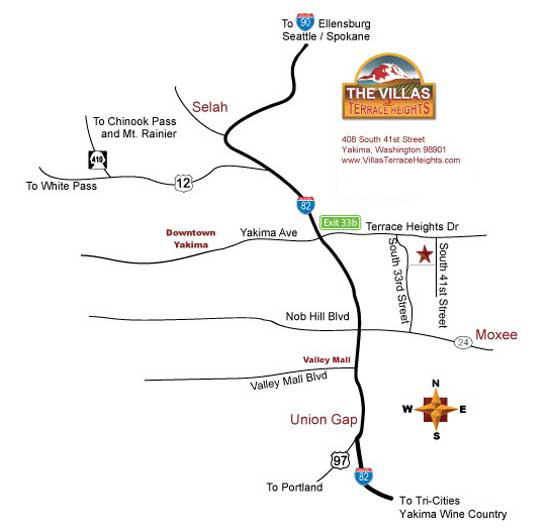 We welcome you to visit our gated retirement community, The Villas at Terrace Heights, located in Central Washington State. Whether you are retired, semi-retired, or a busy professional seeking a quieter pace of life, you will enjoy the amenities of our 55+ gated senior community and the beauty and outdoor and cultural opportunities in the Yakima Valley. Travel east on I-90 towards Ellensburg. Take the I-82 exit (Exit 110) at Ellensburg to Yakima. In Yakima, take Yakima Ave. exit (Exit 33b) toward Terrace Heights. Turn left onto East Yakima Ave. East Yakima Avenue becomes Terrace Heights Drive. Stay on Terrace Heights Drive for 1.8 miles. Turn right onto South 41st Street. 4014 Seasons Parkway will be on your right. Travel west on I-90 towards Ellensburg. Take the I-82 exit (Exit 110) at Ellensburg to Yakima. In Yakima, take Yakima Ave. exit (Exit 33b) toward Terrace Heights. Turn left onto East Yakima Ave. East Yakima Avenue becomes Terrace Heights Drive. Stay on Terrace Heights Drive for 1.8 miles. Turn right onto South 41st Street. 4014 Seasons Parkway will be on your right. Travel east on I-84. Take SR 97 (Exit 104) toward Yakima. SR 97 merges onto I-82 West. In Yakima take the Yakima Ave. exit (Exit 33) toward Terrace Heights. Take the Terrace Heights ramp. Keep right at the fork and merge onto Terrace Heights Drive. Travel eastbound on Terrace Heights Drive for 1.8 miles. Turn right onto South 41st Street. 4014 Seasons Parkway will be on your right. Travel west on I-82 towards Prosser/ Yakima. In Yakima take the Yakima Ave. exit (Exit 33) toward Terrace Heights. Take the Terrace Heights ramp. Keep right at the fork and merge onto Terrace Heights Drive. Travel eastbound on Terrace Heights Drive for 1.8 miles. Turn right onto South 41st Street. 4014 Seasons Parkway will be on your right.